Start your crust process either the night before or at least 2 hours before you will need it to make your pie. Take your vegan butter sticks and chop them into cubes then freeze them for at least a half hour to chill before using. You can also chill your flour for the best pie crusts. Begin with flour in food processor, adding vegan butter pulsing flour and butter until you reach a clumpy dry mixture. .
Next, add in your chilled water a little bit at a time. When your dough is wet you can transfer it onto a floured surface. It should feel a little sticky by this step. Add more flour to properly work with the dough if needed. If you find a few clumps of vegan butter, that is just fine as the vegan butter clumps will melt nicely in the baking process. Separate your dough into two equal round pieces. They will be soft and delicate. Wrap them in plastic wrap and place them in the freezer. Freeze these balls for at least an hour before working with the dough. You can freeze overnight if needed. Pull your dough from the freezer allowing to soften if it is too hard. 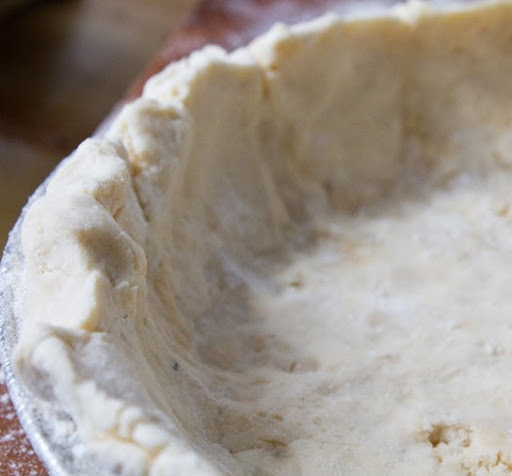 Roll out dough and transfer into a baking pie dish or pan. The crust doesn’t have to be perfect when you transfer. You can always mold the dough in the tin with your fingers.